I was born about 20 years after the Second Vatican Council closed in 1965, so I wasn't around when the controversies began to whirl during that era of the Catholic Church. And I didn't enter into full communion with the Catholic Church until the late 1990s, so my exposure to the Catholic Church in the United States came quite a while after the purportedly wilder times of the 60s and 70s. I was hit by quite a different problem in the Church: the revelation of the extent of the sexual abuse crisis in the decades following Vatican II (and my anger over that is a story for another day). This is probably part of why the reactions to Vatican II among many of those who were around during the 60s and 70s is so baffling to me. I just wasn't there and didn't choose a side in the heat of the moment as the counterculture's wave was cresting. I have the benefit of hindsight and critical distance, which the people who were in the Catholic Church at that time did not have. They were forced to decide as the battle was joined, a notoriously difficult time to see clearly and make the best decisions. I've made many bad decisions in those types of situations, so I can empathize with those who later changed their minds and admitted their behavior at the time was not very good. Bishop Gracida is a good example of this humility of spirit which allows us to own our past mistakes and resolve to correct them going forward. And Bishop Gracida is certainly not the only one to have misgivings about the liturgical innovations that spread rapidly after the Second Vatican Council. There were many, most notably Archbishop Marcel Lefebvre, who had serious concerns about the direction of the Council when it was beginning, not just after it had happened and their mistakes were apparent. Some of them rejected Vatican II as heretical, and others were just worried about Council fathers laying the foundation for future heresy. Some were concerned that, while Vatican II documents contained no heresy and didn't lead to heresy, there were plenty of politically progressive Catholics who would be happy to use it as cover for their heresies that were a result of imposing their political views on the Church so that it would "get with the times." In an interesting twist, those who wanted the Church to get with the times are in many cases now clinging rigidly to the times with which they wanted the Church to get, holding it back from getting with the new times. They don't want to give up their manufactured "liturgical dance" performances for the stillness of contemplative prayer recommended by the Saints and Doctors of the Church, nor do they want to abandon their folksy guitar Masses for the chant prescribed by Vatican II. And when young people who want to use American trance or house electronic music, or European melodic metal, want their preferred music in the Mass, then how urgent do they think it is to get with the times? Not very, in my experience. And despite the fact that Gregorian chant is extremely popular, surprisingly so among young people, are these "get with the times" leaders of the Church in a hurry to make sure it is sung at Mass? No. Just as the pre-Vatican II Traditionalists want to keep things as they are even if it means disobedience to the Church and not keeping up with current trends, the post-Vatican II Traditionalists want to keep things as they are even if it means disobedience to the Church and not keeping up with current trends. The pathology that is often (though not always) present in traditional Catholic circles is the tendency to cling to the liturgy of a particular time and place rather than allowing the Church in her wisdom to participate in the constant renewal of the Christian life through the liturgy. Which is not to say that the hierarchy of the Church has been perfectly clear and coherent, because it has frequently been neither in the last few decades especially. To err is human, so this should not be surprising, and we should pick ourselves back up, ask God's forgiveness, and keep seeking Him. And the situation is generally more complicated than it appears, as this excellent article in First Things explains as it tells the story of the post-Vatican II era. The pre-Vatican II Traditionalists and the post-Vatican II Traditionalists would like to point fingers at one another and insist that the other side is in the wrong on a number of important matters. For myself, I agree with both of them; they have definitely been wrong about some very important matters. And I've been wrong on many important matters myself (a situation that's likely to continue indefinitely), so I know that the best thing to do is admit it when the weight of the evidence suggests that you're wrong. After admitting it, then it's time to correct our behaviors, but that admission of guilt comes first. When we can stop looking at our brother's guilt long enough to examine our own, this becomes much more possible. At that point, the war over liturgical praxis and theology between the pre-Vatican II Traditionalists and the post-Vatican II Traditionalists might reach a cease-fire. Maybe, if we're very fortunate, a peace accord. It's what I have to hope for, not for my own sake, but for the sake of a Church that needs the gifts of both groups without their pathologies and pride tagging along with them. At this point, it doesn't matter who started the war. We need to end it with Christian love for the sake of future generations and for our own. Albert Camus, a well-known French atheist philosopher who was also a revolutionist and syndicalist, was invited by the Dominican monks of Latour-Maubourg to write to them on the topic of "What Unbelievers Expect of Christians" in the year 1948. This may seem strange, but the Dominicans are known for engaging in intellectual dialogue with all sorts of philosophers, and this is very in character for them. Given my own love of intellectual dialogue, particularly with atheists, I think it's worthwhile to at least understand the point of view presented by Camus in his letter responding to the Dominicans. Like most good philosophers, Camus begins with the caveats, explaining what he is not trying to accomplish in his writing and also what he is trying to accomplish. "Inasmuch as you have been so kind to invite a man who does not share your convictions to come and answer the very general question that you are raising in these conversations, before telling you what I think unbelievers expect of Christians, I should like first to acknowledge your intellectual generosity by stating a few principles. First, there is a lay pharisaism in which I shall strive not to indulge. To me a lay pharisee is the person who pretends to believe that Christianity is an easy thing and asks of the Christian, on the basis of an external view of Christianity, more than he asks of himself. I believe indeed that the Christians has many obligations but that it is not up to the man who rejects them himself to recall their existence to anyone who has already accepted them. If there is anyone who can ask anything of the Christian, it is the Christian himself. The conclusion is that if I allowed myself at the end of this statement to demand of you certain duties, these could only be duties that it is essential to ask of any man today, whether he is or is not a Christian." One of the most rare qualities to be found in philosophers (or anyone else) is a genuine humility about the limits of one's knowledge and a deep appreciation for the difficulties faced by others. This is precisely the quality Camus exhibits so clearly here. And he will not try to impose on the Christians a heavier burden than he can bear himself, which I appreciate. I appreciate it especially because of how I relate to my friends who are atheists. I do not ask them to be better Christians, setting upon them a standard they do not accept; I do call those who strive for more evidence-based and rational views to meet their own standards, sometimes by correcting them on a matter of fact or an error in reasoning. And I welcome their corrections when I fail to live up to the standard of Christian charity, just as Camus welcomes reasoned debate. "Secondly, I wish to also declare that, not feeling that I possess any absolute truth or any message, I shall never start from the supposition that Christian truth is illusory, but merely from the fact that I could not accept it. As an illustration of this position, I am willing to confess this: Three years ago a controversy made me argue against one among you, and not the least formidable. The fever of those years, the painful memory of two or three friends assassinated had given me the courage to do so. Yet I can assure you that, despite some excessive expressions on the part of François Mauriac, I have not ceased meditating on what he said. At the end of this reflection--and in this way I give you my opinion as to the usefulness of the dialogue between believer and unbeliever--I have come to admit to myself, and now to admit publicly here, that for the fundamentals and on the precise point of our controversy François Mauriac got the better of me." I admire Camus for his willingness to admit that his opponent had won the argument; I know that's a rare and difficult thing to do. I have lost many arguments myself, but like Camus I usually didn't realize until much later after giving it a great deal of thought. There is a great danger is assuming that we have won the argument and going on without a healthy amount of reconsideration; this danger is that we will probably never find out how wrong we were. "Having said that, it will be easier to state my third and last principle. It is simple and obvious. I shall not try to change anything that I think or anything that you think (insofar as I can judge of it) in order to reach a reconciliation that would be agreeable to all. On the contrary, what I feel like telling you today is that the world needs real dialogue, that falsehood is just as much the opposite of dialogue as is silence, and that the only possible dialogue is the kind between people who remain what they are and speak their minds. This is tantamount to saying that the world of today needs Christians who remain Christians. The other day at the Sorbonne, speaking to a Marxist lecturer, a Catholic priest said in public that he was too anticlerical. 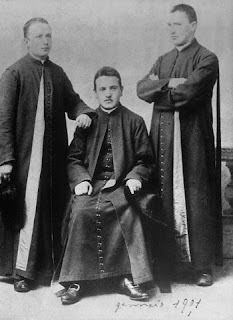 Well, I don't like priests who are anticlerical any more than philosophies that are ashamed of themselves. Hence I shall not, as far as I am concerned, try to pass myself off as a Christian in your presence. I share with you the same revulsion from evil. But I do not share your hope, and I continue to struggle against this universe in which children suffer and die." There is a wonderful realism here about what dialogue is and ought to be. Inevitably, the chances of changing the mind of one's opponent is almost 0%, but there is worthy honor and integrity in being faithful to one's own principles and commitments. Camus, like many atheists and many Christians and many people of many beliefs, is wrestling with the Problem of Suffering here, and is is understandable to question whether God could possibly be a loving God while allowing suffering. This is the profound Problem of Love, and I do not suggest to anyone that it is an easy one to solve. "And why shouldn't I say here what I have written elsewhere? For a long time during those frightful years I waited for a great voice to speak up in Rome. I, an unbeliever? Precisely. For I knew that the spirit would be lost if it did not utter a cry of condemnation when faced with force. It seems that that voice did speak up. But I assure you that millions of men like me did not hear it and that at that time believers and unbelievers alike shared a solitude that continued to spread as the days went by and the executioners multiplied. It has been explained to me since that the condemnation was indeed voiced. But that it was in the style of the encyclicals, which is not at all clear. The condemnation was voiced and it was not understood! Who could fail to feel where the true condemnation lies in this case and to see that this example by itself gives part of the reply, perhaps the whole reply, that you ask of me. What the world expects of Christians is that Christians should speak out, loud and clear, and that they should voice their condemnation in such a way that never a doubt, never the slightest doubt, could rise in the heart of the simplest man. That they should get away from abstraction and confront the blood-stained face history has taken on today. The grouping we need is a grouping of men resolved to speak out clearly and pay up personally. When a Spanish bishop blesses political executions, he ceases to be a bishop or a Christian or even a man; he is a dog just like the one who, backed by an ideology, orders that execution without doing the dirty work himself. We are still waiting, and I am waiting, for a grouping of all those who refuse to be dogs and are resolved to pay the price that must be paid so that man can be something more than a dog." Camus has a valuable point here for Christians generally and Roman Catholics specifically, that while Papal encyclicals may be a very authoritative way of communicating the teachings of the Church, it is not the method that is likely to reach many people. And what good is it to call the world back to what is true, good, and beautiful if most of the world will not hear the call? His point that Christians ought to speak out against terrible injustice in unequivocal terms and accept the risk of severe consequences is also well-taken, at least by me and many other Christians. I'm not so sure that the current generation of unbelievers is very interested in encouraging Christians to speak out, except where those Christians agree with their political programme. Many of them seem to lack Camus' sense that the beliefs of others who hold them sincerely and with integrity ought to be generally respected rather than denigrated. "And now, what can Christians do for us? By what right, moreover, could a Christian or a Marxist accuse me, for example, of pessimism? I was not the one to invent the misery of the human being or the terrifying formulas of divine malediction. I was not the one to shout Nemo Bonus or the damnation of the unbaptized children. I was not the one who said that man was incapable of saving himself by his own means and that in the depths of his degradation his only hope was in the grace of God. And as for the famous Marxist optimism! No one has carried distrust of man further, and ultimately the economic fatalities of this universe seem more terrible than divine whims. Christians and Communists will tell me that their optimism is based on a longer range, that it is superior to all the rest, and that God or history, according to the individual, is the satisfying end-product of their dialectic. I can indulge in the same reasoning. If Christianity is pessimistic as to man, it is optimistic as to human destiny. Well, I can say that, pessimistic as to human destiny, I am optimistic as to man. And not in the name of humanism that always seemed to me to fall short, but in the name of an ignorance that tries to negate nothing. This means that the words "pessimism" and "optimism" need to be clearly defined and that, until we can do so, we must pay attention to what unites us rather than to what separates us." The debate over pessimism isn't one that has the same seriousness attached to it today that it had at the time. Nonetheless, Camus makes some good points here, one of which is to give up vacuous arguments and define the terms very precisely so that they might no longer be vacuous. The other is that in order to be able to defend absolute values, we must have values which are not so absolute to provide the practical political constraints which allow for a space for dialogue in which those values we hold as absolute and transcendent can actually be communicated. Camus also eloquently makes a comparison to certain arguments made by some communists and some Christians that the end or telos of the suffering we undergo in the process of reaching heaven on earth (in the case of communists) or the new heavens and new earth (in the case of Christianity) justifies the suffering undergone by millions of human beings, as if suffering were a necessary evil. Personally, I don't think suffering is evil, so this doesn't present a problem for my point of view. But for those who do think that suffering is evil, it's a point that needs to be taken seriously. "That, I believe, is all I had to say. We are faced with evil. And, as for me, I feel rather as Augustine did before becoming a Christian when he said: 'I tried to find the source of evil and I got nowhere.' But it is also true that I, and a few others, know what must be done, if not to reduce evil, at least not to add to it. Perhaps we cannot prevent this world from being a world in which children are tortured. But we can reduce the number of tortured children. And if you don't help us, who else in the world can help us do this? It may be, I am well aware, that Christianity will answer negatively. Oh, not by your mouths, I am convinced. But it may be, and this is even more probable, that Christianity will insist on maintaining a compromise or else on giving its condemnations the form of the encyclical. Possibly it will insist on losing once and for all the virtue of revolt and indignation that belonged to it long ago. In that case Christians will live and Christianity will die. In that case the others will in fact pay for the sacrifice. In any case such a future is not within my province to decide, despite all the hope and anguish it awakens in me. I can speak only of what I know. And what I know--which sometimes creates a deep longing in me--is that if Christians made up their minds to it, millions of voices--millions, I say--throughout the world would be added to the appeal of a handful of isolated individuals who, without any sort of affiliation, today intercede almost everywhere and ceaselessly for children and for men." It is an oft-stated truth that Christianity is revolutionary. It is a revolt against the oppression of sin, an uprising against the capricious rule of the ego over our lives, a revolution of love which must execute the ego, leaving no room in our lives for the Imperium of transient desires. This a revolution which Christians should and could participate in with more resolve instead of compromising to maintain the comforts of modern life. And it is this comfort which often keeps Christians from speaking up about injustice. There are certainly plenty of examples of Christians doing this, of course. Dietrich von Hildebrand and Dietrich Bonhoeffer come to mind, and Pope Pius XII as well. They fought against the Nazis with what weapons they had and saved many lives. But many Christians in Germany went along with the Nazi pogrom against the Jews because it was easier to blame them for the discomforts caused by economic woes and easier to not speak up. This is not to say that some didn't want to speak up; I'm sure many did want to speak up, but they had families to protect and homes to maintain when the decisions were being made. It is not an easy thing to ask a man to risk not only his own life, but the lives of his entire family, in the interest of speaking out against injustice. Fear has always been a great obstacle for the Christian revolt and the political revolt. Sam Harris has previously pointed out that human beings seem to only have two ways of dealing with conflict: conversation and violence. 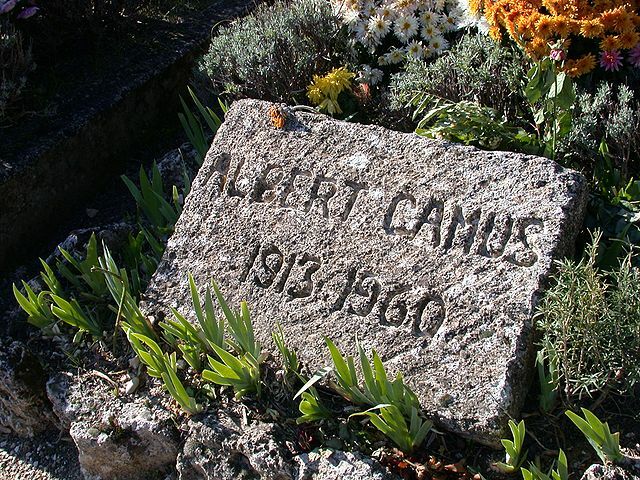 I sincerely hope, along with Albert Camus, that we choose conversation over violence and foster the bold dialogue he envisioned for us, a dialogue in which we are very candid with one another and also humble with one another. I'll happily stand with him against the forces of terror, though that will result in suffering and perhaps even death. 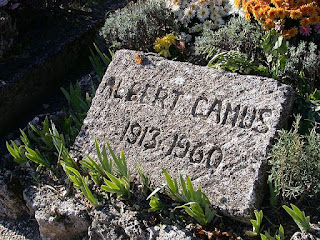 Note: An image of Albert Camus' gravestone. The life of a Christian is to be a holy offering, a public service offered to God to show our love for His super-abundant gifts to us. This service has three parts for each of us as we imitate the three services by which Jesus Christ fulfilled the roles of the people of God, the service of a priest, a prophet, and a king. In the Latin tradition, this is often referred to as the triple munera: the sanctifying, teaching, and governing offices of the Church. Though these roles are performed in a special way by the bishops who are the successors of the Apostles chosen by Christ to serve His Church in a spirit of love as He served them in a spirit of love, we all have a call to participate in those roles. This includes the kingly office of the Pope, the Patriarchs, and the Bishops, who govern the Church as we make the pilgrim's journey through this life, fighting against the snares of evil set by the ego. They set the canons of the Church, the rules which are there to help us keep inside the green pastures through which the Good Shepherd leads us, the Christ who is also the King of Kings. The Feast of Christ the King, implemented in the liturgical calendar in the early 20th century, is a recognition of a quite ancient Christian belief that Christ fulfilled the office of the King of Israel. Jesus Christ is the King of Heaven who did not need the empty promises of Satan who offered Him power over the world in exchange for idolatry; He who was the eternal King had no need to trade the Kingship granted Him by the Father for a kingdom that was of this world because His kingdom is not of this world which will pass away. Christ showed us the the King of Heaven was not here to bring death to many like other kings, but rather to die for us so that many can be saved from death. Christ the King is not here to send us down to Hades, but rather to lift us up to Heaven. Those of us who follow Him must also fulfill this role of lifting others up in love to Heaven rather than tearing them down. Christ is the Icon of Love Himself, the Father who loved us so much that He sent His only-begotten Son to die for us that we might be lifted up to eternal life. He sent His only-begotten Son who showed us how to govern ourselves and others with love, the love of mercy which is an expression of the Lord's divine justice eternally present in the Kingdom of Heaven. Lord, please help me by Your grace to remember You always and follow Your example, to live the life of one who presides in love, rejecting the glamour of evil when it offers me the raw power to enforce my selfish desires across the entire world and instead accepting the cup of suffering so that all those across the world might share with me in eternal life, lifting up my brothers and sisters so that the grave might not hold them and Your face might shine upon them in the Beatific Vision. 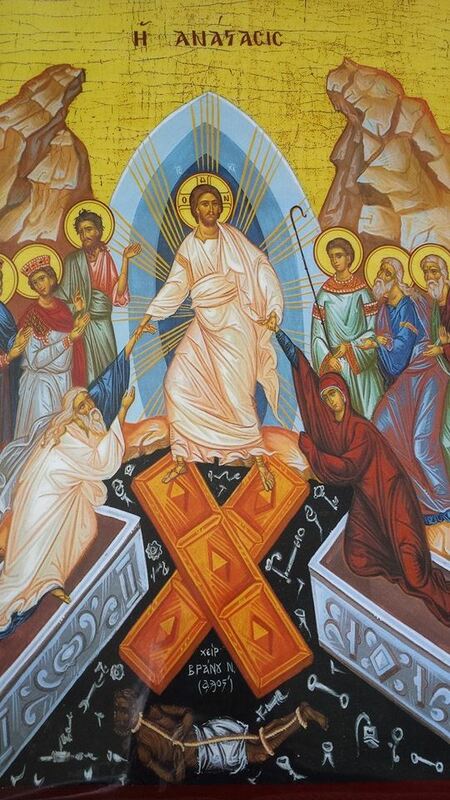 Note: The above is an icon of the Resurrection of Christ. I recently purchased this icon from the Paracletos monastery. As I'm sure many Christians have, I have been trying to understand how I am called to be a prophet in the world. I don't get the impression that the best way I can do that is to stand on a street corner or at the university's fountain and tell people about the Bible. So how should I live out the call to speak truth and call people back to the God who loves them? Being named after the Prophet Samuel (first of the major prophets and also the last of the Judges), I decided to examine his life and see if his example would give me some guidance. One of the first things I noticed is that he made a lot of mistakes, just as I have. This of course did not stop him from serving the Lord with all his heart. He persevered and warned the Israelites who wanted a temporal king that this was not the best thing for them, that they needed the heavenly King. Nonetheless, he was obedient and anointed a king for them, a king who would turn out to provide ample proof that Samuel's warning to them about kings had been true all along. And he was obedient again, anointing David, the man who was a gentle and strong shepherd, a man after God's own heart, as the next king of the twelve tribes of Israel. So too I seek to anoint with love all those God calls me to meet. And through my writing and my speaking and my actions, I strive to call all people back to the God of love as the prophets have done. Like Samuel, I strive to make all parts of my life a holy offering to the one who offered all of His life out of love for me. I am dedicated to serve Him at all times and in all things, listening intently for His voice once I have learned to recognize it. Here I am, Lord. Speak, for Your servant is listening for Your voice. 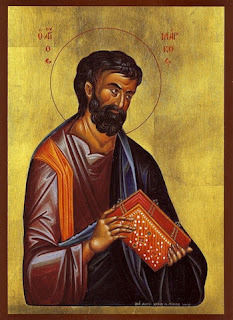 Samuel the Prophet, ora pro nobis! Lord, please help me by Your grace to seek You first in all circumstances and to listen intently for Your call, always coming to meet You with a humble heart which is open to doing Your will, ever calling Your people to return to the God who frees us from the oppression of sin by Your most just statutes, and faithfully anointing all those whose hearts You have seen and known in Your wisdom to be hearts after Your own Sacred Heart. Note: The above is an icon of the prophet Samuel, for whom I was named. I recently purchased this icon from the Paracletos monastery. This includes those who by baptism are incorporated into the Body of Christ, participating in the priesthood of the People of God. St. Mark is among those called by Christ to priesthood under the new covenant, a relative of Barnabas the Levite, a priest under the old covenant. 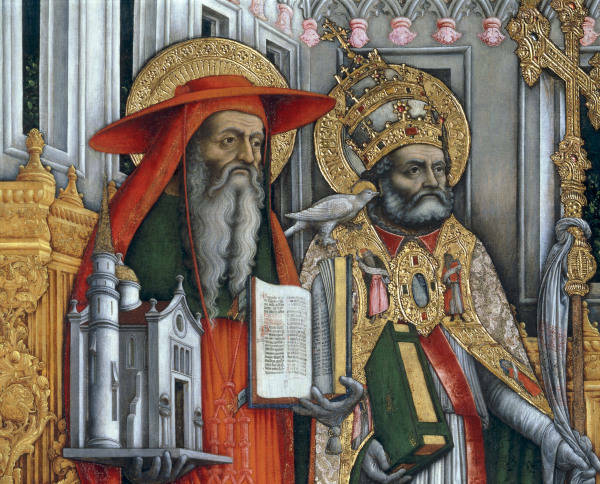 The nature of the priesthood under both old and new covenant is that of offering costly sacrifice for the people of God, and St. Mark certainly did so. According to Church tradition, he was the first bishop of Alexandria in Egypt, and was martyred in the streets of Alexandria for his faith, making the ultimate sacrifice for the love of Jesus the Son of God who was his friend and Master. It was this sacrifice on the cross he recorded in the Gospel of Mark, a great deal of which was taken from the sermons of Peter that Mark heard while in Rome with Peter the Apostle. Mark is depicted in many illuminations of the Gospel writers upon the cover of the Evangelion and the sides of a lectern (ambo), sometimes by his symbol which is the winged lion. He is still commemorated in the Divine Liturgy of St. Mark, an incredibly ancient liturgy which is still celebrated by Christians to this day. The liturgy is a sacrifice of praise at which the sacrifice on the cross is present timelessly, and it is in this priestly sacrifice of priestly sacrifices that Mark who is one of the first priests of the new covenant lives on as an icon of Jesus Christ, the living God who is the High Priest of the new covenant. Mark the Evangelist is my patron saint, chosen when I was confirmed in the Catholic Church, and I often pray that I may become more like Mark who followed faithfully in the footsteps of Christ on the via dolorosa and made himself a living sacrifice, his blood poured out for the love of all like Christ's Precious Blood was poured out that all might have the chance to be saved through Him. St. Mark the Evangelist, ora pro nobis! Lord, please help me by Your grace to be a true friend to You, to be willing to help spread Your love across the world, to faithfully record the great and glorious love of God for all to read, and to make my life a living sacrifice for Your sake as you made Your life a living sacrifice for the sake of my restless soul so that it might find its rest in Your heavenly household. I wrote recently about the kerfuffle over Pope Francis' willingness to study the question of deaconesses. And it is indeed an open question as to whether or not the Church will restore the tradition of deaconesses. The question of whether or not the Church can ordain women to the priesthood has been settled for a long time, and was reiterated in recent history by Pope John Paul II in Ordinatio Sacerdotalis. In First Things, Charlotte Allen suggests that the ordination of women is exactly what proponents of restoring the tradition of deaconesses want, and that they see deaconesses as a step along that path. There were comments on her article suggesting that she had unfairly characterized proponents of bringing back deaconesses as being motivated by politics or power. And that has some weight to it as a criticism. It's very unlikely that every single person in favor of a return to that early Church discipline is motivated by power or politics. But a lot of them are indeed motivated exactly by politics and power. If that weren't the case, they wouldn't be making feminist critiques of the sort used to identify discrimination against women by governments and pave the way to empower women by making sure they have access to roles traditionally held by men. For example, the WomenPriests website, and this petition at Groundswell argue that equality for women implies that priestly ordination should be open to women as well as ordination as deaconesses. Catholic priests have power in a way that other baptized Christians do not. Catholic priests are all men. Therefore women are being excluded from having power in the Catholic Church. There are of course other arguments from Christian tradition that aren't completely dependent on the common academic feminist modes of analysis that are rooted in anti-Christian ideologies. Saint Thekla, Protomartyr and Equal to the Apostles is an example of a woman who might make us think that women should have the same authority as men in the Church. After all, if she is truly Equal to the Apostles, doesn't it follow logically that she has the same roles and authority? It only follows logically if we are using the above power analysis, a political analysis in which it is assumed that different roles and authority are an instance of inequality. This definition of inequality is not the only one. The commonly accepted definition of equality is that two people have the same value when they are equal, not that they have the exact same roles and authority. I will never have the role of a midwife or the authority of a Queen, but this does not logically imply that I have less value as a person than a midwife or a Queen. As someone who used to think ordaining women to the priesthood in the Catholic Church was perfectly acceptable and also inevitable, I'm pretty familiar with the arguments for it. And I sympathize with those who make the arguments for it only to be dismissed out of hand. It's a question worth wrestling with, and it's unfortunate that many would rather just toss it aside as not worth any consideration because it came to the fore as second-wave feminism was cresting, being obviously influenced by the social and political critiques of second-wave feminism. Though I eventually changed my mind and no longer think it would be consonant with Christian tradition to ordain women as priests or deacons (you can read about my thought process here), it is precisely because I want to use the same approach of looking at Christian tradition that I have no objections to restoring deaconesses to the life of the Church. If the Church in Her wisdom decides that the ministry and disciplines of celibate women performing acts of service in the community and the liturgy are needed once again outside of convents and monasteries, I will gladly assent to that decision. Unfortunately, I suspect that if the Church did decide to do this, many would point to the other side of the debate over women's ordination and say, "Look how very wrong they are!" The folks who are reflexively opposed to the ordination of women would be understandably worried that the Church was allowing political concerns to transcend Christian concerns. And the folks who are in favor of the ordination of women would be understandably disappointed when the Church failed to ordain any women as priests shortly after restoring the discipline of deaconesses, leaving women without equal access to power. The best and worst argument for bringing back deaconesses may be that it would make almost everyone upset because they were worried more about their political concerns than about the life of the Church, creating an opportunity to explain that a Christianity which doesn't transcend our politics isn't a Christianity worth having. The Christianity worth having isn't the Christianity of politics, but rather the Christianity of Thekla, the Christianity worth living fully for and dying for so that we can be with Christ eternally. 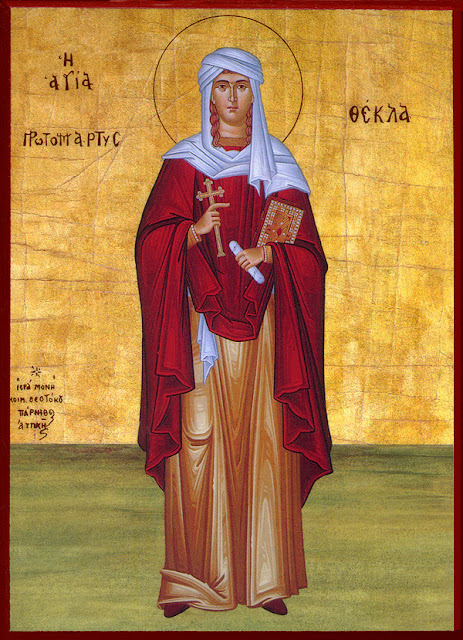 Note: The above is an icon of Saint Thekla, Equal to the Apostles. Music suffuses contemporary life; never has music from all over the world been so widely available to so many people. An extraordinary amount of time and effort goes into producing and listening to music by those who have the means to fill their ears with its sounds and silences. Oh how our hearts yearn to be moved by music! Our feet find their places more smoothly with the help of music, and our hands reach out to comfort others so as to share the peace music brings to our minds. When we listen to music, our will to exercise grows stronger and remains longer. Music uplifts all the faculties of our souls. We play music to celebrate a life well-lived at a funeral, to grieve for love lost after a heartbreaking breakup, to remind us of joyful moments on the anniversary of our wedding, to soothe the crying child we love so much that our hearts burst with more love than they could ever hold before. One of the most romantic and meaningful things a lover can do for his beloved is compose and play a song for her, to her, and with her. Through music we offer to those love the very best of what we can create, the best of what moves the heart, the best of what provides the body with rhythm, the best of what calms the mind, and the best of what strengthens the will. Music well done is music written for the love of another person, played for another person, and sung for another person. The best music of all is music written for Love Himself, the Son who died on the cross for the love of all His Father's children. The best music of all is a gift of our greatest talents in the service of Him from whom we were given all those talents, a returning of the music which uplifts the soul to the creator of the soul. The best music of all is the music which reflects the harmonies and melodies of divine love and directs them to the font of divine love from which they first sprang into creation and watered the world with the rhythms of life. This is the music of Love, and it is the music of the Church His Bride who has participated in it for millenia. It is God's song to the souls of all those made in His image and likeness, a love song to the icons of Love. It is the music of Love which we give back to Love Himself because it is the most worthy music we can offer to Him in our smallness, lifting up to Him our little voices in song as He lifts up our souls with the song of divine love which moves through all of Creation. This music of Love is the music which has the words of Sacred Scripture as the foundation of its lyrics, the divine revelation of Love's creation sung to us over and over, ever new and refreshing to the soul. Just as by the lover's devotion to his beloved he loves to death his selfishness and habituates himself to a constant process of giving the radical gift of all that the best of himself is to her, so too we who love God give Him all the best of ourselves and habituate ourselves to a life of radical self-gift. We enter ever more fully into the song of divine love which suffuses all of creation, making our lives into an ever more magnificent sacrifice of praise, the love present in our lives becoming the music of Love Himself. We are called to order our lives along the scale of Love's most just statutes, to hang the habits which are the notes of our life's song in the sequence prescribed by Love and His Bride. We are called to both sing boldly of the greatness of Love and to let our love for others be a song which everyone can hear and know that it speaks of God's love for us and for our love of Him. We are called to enter into the song of Love, and by composing our lives as a piece of the music of Love we love to death all those parts of us which cannot partake of the divine harmonies and melodies ever-present in the heavenly household of our Father. Note: The above piece is one of the most lovely compositions I've heard for liturgical music. The fire inside me has died many times. Often, I did not feed it with enough prayer from the heart to keep it burning. I let the kindling and the long-burning logs be turned to ash without refreshing them from the fruits of my daily labors. And each time I am left with cold ashes on top of warm embers, I must rush to start the fire yet again, the fire which died because I did not tend to it with the attentive spirit of love. I am grateful that each and every time the fire dies, there is a spark to help me rekindle the fires of love in my heart. The spark of a heartfelt prayer lights my heart's fires up again and again, providing the impetus for the fires of love to roar in the hearth of my life once again. The embers of my heart are kept warm by the fires of compassion which burn so long as I reach out in love to those who have less than I do, the poor and vulnerable who should be welcome to the best I have and not relegated to eating the scraps from my table. Prayer and compassion keep the fires of my heart burning quickly and strongly, my selfishness being consumed in each instant to leave only a pure metal of love, the metal strong enough to pierce even the hardest hearts of stone and make them hearts for love alone. Prayer and compassion are the languages of love, the languages which transcend differences of syntax and semantics and sonority. It is the languages of love which allow us to speak to the hearts of all people whether we can understand the words they use or not. The tongues of love which allow us to communicate without words are prayer and compassion, and it is these tongues which keep the fire of love burning in our hearts when our words fail us. These tongues of love are the tongues of fire which light our hearts anew. It is these tongues of fire which descended upon the Apostles at Pentecost in the midst of the mighty wind, the most powerful of winds which bore the breath of God that hovered over the waters at the creation of the earth. The Holy Spirit which moved the waters is also the Holy Spirit which fuels the tongues of fire coming down to set fire to the hearts of those chosen by God to bear His message of love to the whole world. The Holy Spirit fills us with the fire of Love so that no matter the tongue spoken by those we encounter on the journey, we can speak to them with the tongues of love which transcend our differences, the universal tongue of divine love revealed in the human heart. Like the Apostles who gathered as one in prayer in the Upper Room, when we allow our hearts to be lit by the spark of Love Himself we can then be touched by the God who is a consuming fire. As icons of Love Himself, we are made in the image and likeness of the consuming fire which burns up everything which is not made of the metal of divine love. We are made to burn with the fires of love; we are made to be set afire, a new creation which is lit by the tongues of the fire of Love. By the tongues of fire, we are set alight like the burning bush, ever burning but not burned out, the fires of love consuming all that is not of love, loving to death all that is not of Love Himself. Along with the candles in our churches, we are to be lit with the spirit of love as an offering of prayer to Him who is Love. Just as in the church the Paschal candle is lit at the Feast of the Resurrection so that it will give light to the sanctuary for the cycle of the liturgical year, so too we can be lit by the tongues of the fire of love which were given to the Church so that all of our years might be filled with the light of Love burning in the sanctuary of our hearts. We are the lamps which must not be hidden under a bushel basket, and like the Apostles we are called to be set alight with tongues of the fire sent down by Love Himself. 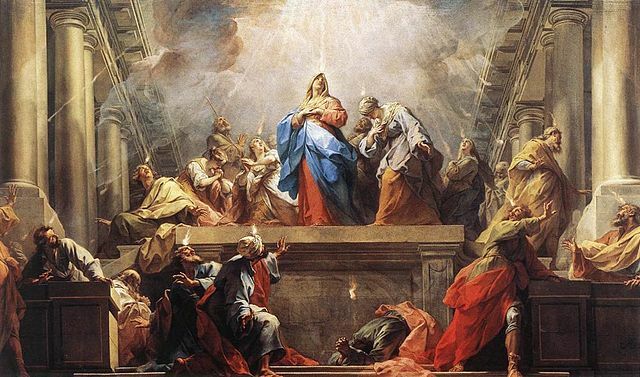 Note: The above painting is a depiction of the events of Pentecost, when the fire of heaven descended upon the minds of men. Now that I have read through the Divine Liturgy of St. 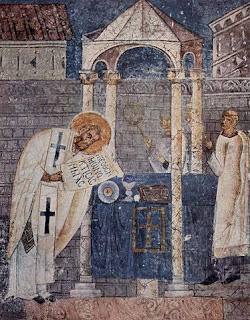 Basil the Great and also participated in it, I want to examine the Divine Liturgy of St. Gregory the Great. As a Roman Rite Catholic, this has particular interest for me because it is the venerable ancestor, so to speak, of the liturgy used today in Roman Rite parishes I've attended for the last 15+ years. The particular version of it that I will be using is one put out by the ROCOR (Russian Orthodox Church Outside of Russia), and as such is slightly modified to suit their purposes in establishing the Western Rite Vicariate. Those changes have in no way diminished the extraordinary beauty of the sung prayers or the unsung prayers specific to this Divine Liturgy. Before a Solemn Liturgy, the sacred vessels stand upon a Table of Preparation, or at the Credence Table, prepared with bread, wine, and water for the Holy Liturgy. Before a Simple Liturgy the sacred vessels may stand, veiled, upon the outspread antimensium (or upon an outspread Corporal if the antimensium is kept permanently beneath the altar cloths) in the midst of the altar. In such case, the gifts are prepared at the time of the Preparation during the Liturgy. for all ages of ages. Amen. Accept, most Holy Father, this bread, let it become for us the holy Body of your only begotten Son, Jesus Christ by the power of the Holy Spirit. Accept, most Holy Father, this wine, let it become for us the holy Blood of your only begotten Son, Jesus Christ by the power of the Holy Spirit. For from his side came forth blood and water for the forgiveness of sins. With a spirit of humility, and a contrite heart, let us be acceptable to you, O Lord; and let these gifts be so offered in your sight this day, that they be pleasing to you, our Lord and our God. Come, O Sanctifier, and bless these gifts set apart for the glory of your Holy Name. Then the veils are placed upon the vessels. The above prayers for preparing the gifts are from the venerable Ambrosian Rite. Server: To the God of my joy and gladness. Server: And I will go to the altar of God, the God of my joy and gladness; and on the harp I will give thanks to you O God my God. Priest: Why are you so sorrowful O my soul? And why are you so disquieted within me? Server: Put your trust in God! For I shall yet praise him who is the help of my countenance, and my God. Server: As it was in the beginning, is now and ever, for all ages of ages. Amen. Server: The maker of heaven and earth. Priest: I confess to Almighty God, to blessed Mary ever Virgin, to blessed Michael the Archangel, to blessed John the Baptist, to the holy Apostles Peter and Paul, to all the saints, and to you, brethren that I have sinned exceedingly in thought, word, and deed, through my fault, through my fault, through my very great fault. Therefore, I beseech blessed Mary ever Virgin, blessed Michael the Archangel, blessed John the Baptist, the holy Apostles Peter and Paul, all the saints, and you, brethren, to pray to the Lord our God for me. Server: May Almighty God have mercy on you, forgive you your sins, and lead you to life everlasting. Server: I confess to Almighty God, to blessed Mary ever Virgin, to blessed Michael the Archangel, to blessed John the Baptist, to the holy Apostles Peter and Paul, to all the saints, and to you, Father, that I have sinned exceedingly in thought, word, and deed, through my fault, through my fault, through my very great fault. Therefore, I beseech blessed Mary ever Virgin, blessed Michael the Archangel, blessed John the Baptist, the holy Apostles Peter and Paul, all the saints, and you, Father, to pray to the Lord our God for me. Priest: Almighty God have mercy on you, forgive you your sins, and lead you to life everlasting. Priest: Turn to us, O God, and bring us to life. Server: And your people shall rejoice in you. Server: And grant us your salvation. Server: And let my cry come to you. Server: And with your spirit. Priest: Let us pray: Purify us, O Lord, we pray, that we be accounted worthy to go into the holy of holies with cleansed minds through Jesus Christ our Lord. Priest: Almighty God, to whom all hearts are open, all desires known, and from whom no secrets are hid, cleanse the thoughts of our hearts by the inspiration of your Holy Spirit that we may be worthy to serve you and fittingly magnify your holy name through Christ our Lord. Deacon: Let us go forth in peace! All: In the name of Christ. Amen! The Procession now forms and proceeds to the Altar. The traditional order is Thurifer, Subdeacon with the cross, two acolytes with candles, Master of Ceremonies, Deacon carrying the Gospel, and Priest. These preparations may seem lengthy, but in comparison to the preparations traditionally performed before some other liturgies, they are not onerous. Of course, when performed with great love as all liturgical prayer should be, we will rarely notice the length of it unless our body fails and brings attention to it. Another thing I noticed while reading the Divine Liturgy of St. Gregory the Great is that unlike some others, the music is embedded in the document and clearly notated as chant so that it can be sung. This is because the liturgy is meant to be sung prayer, at least in large part. The priest wears a cope. R. And let our cry come to you. Let us pray. O Holy Lord, Father Almighty, Everlasting God, hear us we pray and send your Holy Angel from heaven to guard, cherish, protect, visit and evermore defend all who gather in this dwelling place; Through Christ our Lord. Amen. Though all of these prayers are sung, not all need chant notation, because the members of the parish are all accustomed to chanting those common responses that do not change with the liturgical cycle of seasons such as Advent, Lent, and Ordinary time. One of the things that is commonly chanted is the Introit for the day, which is something I've been singing in chant recently at Mass myself. The Introit, Offertory, and Communion chant are largely straight from Sacred Scripture and easy to sing. It also adds a wonderful dimension to my personal prayer. The Introit is sung as the procession goes to the altar; if the Asperges is used it is begun at the conclusion of the final prayer. Let this incense be blessed by him in whose honor it is burned. Amen. Lord, kindle in us the fire of your love, and the flame of everlasting charity. The Kyrie and the Gloria follow these prayers, both of which are also traditionally sung and are incredibly prayerful and beautiful when they are sung. Also, the Collect, the Old Testament reading, a reading from the Epistles, and a reading from the Gospels. This sequence of readings will be very familiar to Roman Rite Catholics who celebrate the post-Vatican II reformed Mass of Pope Paul VI. What may not be as familiar are the prayers of the priest as he prepares to proclaim the Gospel or the prayers over the Catechumens. The acolyte moves the Missal to the Gospel Side of the Altar, the acolytes get candles, and the thurifer brings incense and boat to the priest. All stand as The Alleluia is sung: Alleluia! Alleluia! Alleluia! Praise to you Lord Jesus Christ King of endless glory. Cleanse my heart and my lips Almighty God, as you cleansed the lips of the prophet Isaiah with a burning coal. Send me, purified by your gracious mercy, that I may worthily proclaim your holy Gospel, through Christ our Lord, Amen. The Deacon takes the book to the Bishop/Priest and asks a blessing. Deacon: Master/ Father, ask a blessing. Priest: The Lord be in your heart and upon your lips that you may worthily and fittingly proclaim the Holy Gospel. People: And with your spir-it. The Deacon traces a cross on the book then his forehead, lips and chest. Deacon: The Con-tin-u-a-tion (Be-gin-ning) of the Ho-ly Gos-pel ac-cord-ing to N.
People: Glo-ry to You, O Lord! Deacon: The Gos-pel of The Lord! The Gospel Book is kissed by the Celebrant and he may bless the people with the Gospel Book. If Baptism and Chrismation is administered here the Creed is not repeated. A priest may use the traditional dismissal of the Catechumens if he sees fit. They approach him when the Deacon dismisses them as he stands at the head of the nave. They receive the priest’s blessing and quietly leave. Today, in many churches they withdraw to the Narthex or the last pew. Deacon: All catechumens, depart! Depart, catechumens! Let no catechumen remain. Deacon: Rise up, ye catechumens, beg for yourselves the peace of God through His Christ: a peaceable day free from sin, now and for the rest of your life, and a Christian end of it; the compassion and mercy of God and the forgiveness of your transgressions. Dedicate yourselves to the only unbegotten God, through His Christ. Bow down your heads, and receive the blessing. Priest: O Almighty God, inaccessible and un-begotten, who alone are the true God, the God and Father of your only begotten Son: the Christ; the God who sends forth the Comforter, and Lord of the whole world; who by Christ appointed your disciples to be teachers of piety. Look down upon your servants, who are receiving instruction in the Gospel of your Christ, and “give them a new heart, and renew a right spirit within them” that they may both know and do your will with full purpose of heart, and with a willing soul. Grant them a holy admission and union with your holy Church, and make them partakers of your divine mysteries, through Christ, who is our hope, and who died for them; by whom glory and worship be given to you in the Holy Spirit for all ages of ages. Amen. And after this, let the deacon say: Go out, catechumens, in peace. After the prayer for the Catechumens, the Nicene Creed is sung, the Prayers of Supplication are sung, and then the sign of peace is given. The length of the service may seem prodigious at this point to the average 20th century Catholic accustomed to 1 hour Masses, but this is actually quite expedient for an ancient liturgy. From the side of the Lord Jesus Christ came forth Blood and Water for the forgiveness of our sins. Christ our God to earth descends, our full homage to demand. As we enter now the timeless mystery, let us lay aside earthly cares. * "Alleluia! Alleluia! Alleluia! Lord Most High!" * During Lent: Ho-ly, Ho-ly, Ho- - - ly! Ho-ly, is the Lord Most High! Sanctify O Lord, these gifts offered by us, and cleanse us from the stains of our sins; through Jesus Christ our Lord. Through the intercession of Blessed Michael the Archangel, standing at the right hand of the altar of incense, and of all your elect, Lord bless this incense and receive from it an odor of sweetness; through Christ our Lord. Amen. Let this incense arise before You, O Lord, and Your mercy descend upon us. Let my prayer, O Lord, arise like incense before You; the lifting up of my hands, like the evening sacrifice. Lord enkindle in us the fire of your love and the flame of everlasting charity. Wash me, O Lord, from my iniquity, And cleanse me from my sin. Accept, most Holy Trinity, this offering which we are making to You in remembrance of the passion, death, resurrection, and ascension of Jesus Christ, Our Lord; and in honor of blessed Mary, ever Virgin, and of all the Saints; that it may add to their honor and aid our salvation. May they deign to intercede in heaven for us who honor their memory here on earth. Through the same Christ our Lord. After all this preparation, the Anaphora is finally very close. This may seem like a lot of preparation to go through for munching on a piece of bread, and it really is if we're just talking about a piece of bread. The only way this liturgy makes any sense, or any ancient liturgy makes any sense, is if the bread is truly the Body of Christ as Jesus said that it was at the Last Supper. save us from eternal damnation, and number us among those you have chosen. Bless and approve our offering, O Father; make it acceptable to you. By the power of the Holy Spirit, let it become for us the body and blood of Jesus Christ, your only Son, our Lord. He lifts the paten with the Lamb slightly. "Take, eat: This is my Body, which is given for you." He pauses for a moment then replaces the paten. He lifts the chalice slightly. "Take this all of you, and drink of it: This is my Blood, The Blood of the new and eternal covenant, which shall be shed for you and for many for the forgiveness of sins. He pauses for a moment then replaces the chalice. Do this for the remembrance of me." The Deacon steps forward and replaces the purificator and pall. The Priest stretches out his hands keeping his thumbs and forefingers joined. as once you accepted the gifts of your just servant Abel, the sacrifice of Abraham, our father in faith, and the bread and wine offered by your high priest Melchisedech. He joins his hands, places his left hand on his breast, and signs himself. and upon these offerings: make this bread the Body of your Christ, and the wine within this cup the precious Blood of Christ, being changed by that same Holy Spirit. He stands upright, places his left hand on his breast and signs himself. Remember, Lord, those who have died and have gone before us sealed with the sign of faith, and who rest in the "sleep of peace." The Deacon and Subdeacon step up beside the Priest at the altar. The Deacon removes the pall. Through whom, O Father, you unceasingly create all these good things; sanctifying them, and filling them with life; you bless them and bestow them on us. Such a beautiful liturgy is not the work of one person, but rather an accumulation of Christian strivings to offer God the very best sacrifice of praise we can muster. Sometimes those accumulations need reform, and sometimes they are wonderful and should be retained for the sake of offering our best and highest to the one who offered His only-begotten Son for us. St. Gregory the Great, like St. Basil the Great, was a reformer of the liturgy, making changes to the sequence of the prayers, to the liturgical garb of subdeacons, and to the music as well. Gregorian Chant, greatly enjoyed by many even today outside of any formal liturgical setting, is something he apparently had a hand in compiling. There is good evidence that Gregorian Chant is not, as some have claimed, an achievement of later musicians that was attributed to him. No doubt he was building upon the long tradition of chant already in the liturgy, a tradition we see in the many other Christian liturgies. For example, the Ambrosian Chant attributed to St. Ambrose of Milan is another example from the Western tradition of sacred music. In any case, I am grateful for their stewardship of the Divine Liturgy which has allowed me to offer a far better sacrifice of praise to God than I would by my own lights. St. Gregory the Great, ora pro nobis! 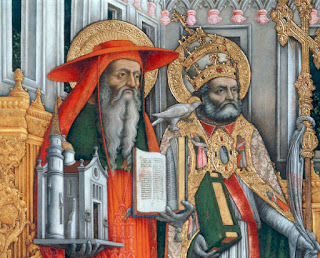 Note: The above depicts St. Jerome and St. Gregory the Great, known as St. Gregory Dialogos in Eastern Orthodox churches. For the past two years, I have attended an Antiochian Orthodox parish about once a month. For most of that time, the Divine Liturgy of St. John Chrysostom was prayed every Sunday, and I grew accustomed to praying it with them. Recently, the Divine Liturgy of St. Basil the Great began to be prayed there instead, and it seemed to correspond with their Lenten observance, which for those who don't know works a little differently than Roman Rite Lenten observance, partially because of the differing liturgical calendars, differing cultural contexts, and also because of disciplinary changes made to the Roman Rite by the Popes. One thing I was told to pay attention to while reading the text of the liturgy is the prayers which the priest is charged with lifting up to the Lord on behalf of all the flock. So I did. I read all of the priest's and deacon's parts for the Divine Liturgy. I paid special attention to the anaphora, the Eucharistic prayers which correspond to the Canon of the Mass in the Roman Rite. And for those who are accustomed to the Roman Rite liturgy, the structure of the following prayers from the anaphora should seem very familiar, though the prayers are not exactly the same in every way. One thing I noticed about the priest's prayers in the Divine Liturgy of St. Basil the Great is that they are quite long. The length of the prayers is quite noticeable not just when looking at the text, but also when attending the liturgy. I'm really not sure how the priest makes it through without a couple of bottles of water to help, but he does. Maybe the fact that these prayers are so beautiful in the way they present a sacrifice of praise to God helps him to keep going. Part of the reason for the length of the prayers is that they are an elucidation of salvation history, weaving together Old Testament and New Testament in such a way that it is clear how they both find their fulfillment in the Gospels, specifically the crucifixion, descent into Hades, and resurrection of Christ. The Divine Liturgy is kerygmatic; one cannot attend it and actually pay attention without hearing anew the Gospel of Jesus Christ. Priest: And unite us all to one another who become partakers of the one Bread and the Cup in the communion of the one Holy Spirit. Grant that none of us may partake of the holy Body and Blood of Your Christ to judgment or condemnation; but, that we may find mercy and grace with all the saints who through the ages have pleased You: forefathers, fathers, patriarchs, prophets, apostles, preachers, evangelists, martyrs, confessors, teachers, and every righteous spirit made perfect in faith. Priest: Especially for our most holy, pure, blessed, and glorious Lady, the Theotokos and ever virgin Mary. People: All of creation rejoices in you, O full of grace: the assembly of angels and the human race. You are a sanctified temple and a spiritual paradise, the glory from whom God was incarnate and became a child; our God, existing before all ages. He made your womb a throne, and your body more spacious than the heavens. All of creation rejoices in you, O full of grace. Glory to you. While the Divine Liturgy contains a re-enactment of the Last Supper, the prayers make obvious that this is not only a remembrance, but also an entrance into the the Holy Sacrifice on the cross. In the Divine Liturgy, we cannot help but feel our own humility before the glory of God when we listen closely to the humility of the priest's prayers and remember our own sinfulness as we contemplate Christ's sacrifice. And while my post-Reformation Christian friends may find the prayers directed at Mary, the Mother of God to be unnerving in the honor they give to her, I am astounded by their beauty and enjoy seeing the love my brothers and sisters in the ancient churches have for our adopted mother, the Queen of Heaven who became our mother when (as the Scripture says) we became adopted sons and daughters of God through the blood of Christ. Priest: For Saint John the prophet, forerunner, and baptist; for the holy, glorious, and most; honorable ; apostles; for Saint(s) (Name;s), whose memory we commemorate today; and for all Your saints, through whose supplications, O God, visit us. Remember also all who have fallen asleep in the hope of the resurrection to eternal life (here the priest commemorates the names of the deceased) . And grant them rest, our God, where the light of Your countenance shines. Again, we pray to You, be mindful of Your holy, catholic, and apostolic Church, which is from one end of the inhabited earth to the other. Grant peace to her which You have obtained with the precious blood of Your Christ. Strengthen also this holy house to the end of the ages. Remember, Lord, those who have brought You these gifts, and for whom and through whom and the intentions for which they were offered. Remember, Lord, those who bear fruit and do good works in Your holy churches, and those who remember the poor. Reward them with Your rich and heavenly gifts. Grant them in return for earthly things, heavenly gifts; for temporal, eternal; for corruptible, incorruptible. 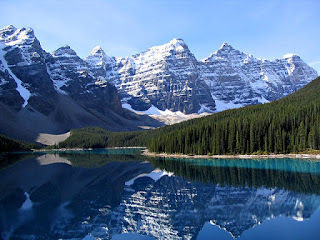 Remember, Lord, those who are in the deserts, on mountains, in caverns, and in the chambers of the earth. Remember, Lord, those living in chastity and godliness, in asceticism and holiness of life. Remember, Lord, this country and all those in public service whom you have allowed to govern on earth. Grant them profound and lasting peace. Speak to their hearts good things concerning your Church and all your people that through the faithful conduct of their duties we may live peaceful and serene lives in all piety and holiness. Sustain the good in their goodness; make the wicked good through Your goodness. Remember, Lord, the people here presented and those who are absent with good cause. Have mercy on them and on us according to the multitude of Your mercy. 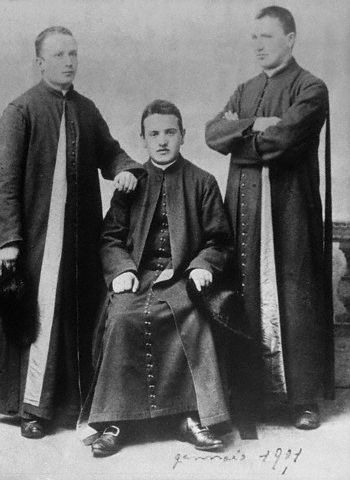 Fill their treasuries with every good thing; preserve their marriages in peace and harmony; nurture the infants; instruct the youth; strengthen the aged; give courage to the faint hearted; reunite those separated; bring back those in error and unite them to Your holy, catholic, and apostolic Church. Free those who are held captive by unclean spirits; sail with those who sail; travel with those who travel; defend the widows; protect the orphans; liberate the captives; heal the sick. Remember, Lord, those who are in mines, in exile, in harsh labor, and those in every kind of affliction, necessity, or distress; those who entreat your loving kindness; those who love us and those who hate us; those who have asked us to pray for them, unworthy though we may be. Remember, Lord our God, all Your people, and pour out Your rich mercy upon them, granting them their petitions for salvation. Remember, O God, all those whom we have not remembered through ignorance, forgetfulness or because of their multitude since You know the name and age of each, even from their mother's womb. For You, Lord, are the helper of the helpless, the hope of the hopeless, the savior of the afflicted, the haven of the voyager, and the physician of the sick. Be all things to all, You who know each person, his requests, his household, and his need. Deliver this community and city, O Lord, and every city and town, from famine, plague, earthquake, flood, fire, sword, invasion of foreign enemies, and civil war. Priest: Above all, remember, Lord, our Archbishop (Name) and our Bishop (Name): Grant that they may serve Your holy churches in peace. Keep them safe, honorable, and healthy for many years, rightly teaching the word of Your truth. Deacon: Remember also, Lord, those whom each of us calls to mind and all your people. People: And all Your people. Many of the petitions contained in the prayers are common to all the Christian liturgies with which I'm familiar, such as prayers for the saints we remember on particular feast days, prayers for the Church, prayers for those in need, and prayers for the Bishops and the rest of the clergy. These particular prayers of petition just happen to be very lengthy and eloquent while having the great theological depth we see in other ancient Christian liturgies. Priest (in a low voice): Remember, Lord, all Orthodox bishops who rightly teach the word of Your truth. Remember Lord, my unworthiness according to the multitude of Your mercies; forgive my every transgression, both voluntary and involuntary. Do not take away the grace of Your Holy Spirit from these gifts presented because of my sins. Remember, Lord, the presbyters, the diaconate in Christ, and every order of the clergy, and do not confound any of us who stand about Your holy altar. Visit us with Your goodness, Lord; manifest Yourself to us through Your rich compassion. Grant us seasonable weather and fruitful seasons; send gentle showers upon the earth so that it may bear fruit; bless the crown of the year of Your goodness. Prevent schism in the Church; pacify the raging of the heathen. Quickly stop the uprisings of heresies by the power of Your Holy Spirit. Receive us all into Your kingdom. Declare us to be sons and daughters of the light and of the day. Grant us Your peace and love, Lord our God, for You have given all things to us. Priest: And grant that with one voice and one heart we may glorify and praise Your most honored and majestic name, of the Father and the Son and the Holy Spirit, now and forever and to the ages of ages. Priest: The mercy of our great God and Savior Jesus Christ be with all of you. Deacon: Having remembered all the saints, let us again in peace pray to the Lord. Deacon: For the precious Gifts offered and consecrated, let us pray to the Lord. Deacon: That our loving God who has received them at His holy, heavenly, and spiritual altar as an offering of spiritual fragrance, may in return send upon us divine grace and the gift of the Holy Spirit, let us pray. Deacon: Having prayed for the unity of the faith and for the communion of the Holy Spirit, let us commit ourselves, and one another, and our whole life to Christ our God. Priest (in a low voice): Our God, the God who saves, You teach us justly to thank You for the good things which You have done and still do for us. You are our God who has accepted these Gifts. Cleanse us from every defilement of flesh and spirit, and teach us how to live in holiness by Your fear, so that receiving the portion of Your holy Gifts with a clear conscience we may be united with the holy Body and Blood of Your Christ. Having received them worthily, may we have Christ dwelling in our hearts, and may we become the temple of Your Holy Spirit. Yes, our God, let none of us be guilty before these, Your awesome and heavenly Mysteries, nor be infirm in body and soul by partaking of them unworthily. But enable us, even up to our last breath, to receive a portion of Your holy Gifts worthily, as provision for eternal life and as an acceptable defense at the awesome judgment seat of Your Christ. So that we also, together with all the saints who through the ages have pleased You, may become partakers of Your eternal good things, which You, Lord, have prepared for those who love You. People: Our Father, who art in heaven, hallowed be Thy name. Thy Kingdom come, Thy will be done, on earth as it is in heaven. Give us this day our daily bread; and forgive us our trespasses as we forgive those who trespass against us; and lead us not into temptation, but deliver us from evil. Priest (in a low voice): Lord Master, the Father of mercies and God of every consolation, bless sanctify, guard, fortify, and strengthen those who have bowed their heads to You. Distance them from every evil deed. Lead them to every good work and make them worthy to partake without condemnation of these, Your most pure and life-giving Mysteries, for the forgiveness of sins and for the communion of the Holy Spirit. Priest: By the grace, mercy, and love for us of Your only; begotten Son, with whom You are blessed, together with Your all holy, good, and life giving Spirit, now and forever and to the ages of ages. Priest (in a low voice): Lord Jesus Christ, our God, hear us from Your holy dwelling place and from the glorious throne of Your kingdom. You are enthroned on high with the Father and are also invisibly present among us. Come and sanctify us, and let Your pure Body and precious Blood be given to us by Your mighty hand and through us to all Your people. Eventually, the prayers do get shorter and quieter. But they are no less beautiful or potent. The priest continues to pray with humility, both for himself and for us all so that we might not be condemned by eating and drinking unworthily of the Body and Blood of Christ. And in the midst of these prayers, the Our Father is of course present, because in any any liturgy we should pray as Jesus has taught us to pray through the oral traditions handed on to us by His disciples and their successors, later recorded in the Sacred Scripture which suffuses the liturgical prayers. St. Basil the Great may have reformed the liturgy of his time, but it has certainly not been decreased by the reforms. He is said to have given it a more penitential character, which is perhaps why it was used during Great Lent. Any reform of the liturgy which can help draw us more deeply into the Repentance of Love is a worthwhile reform indeed. St. Basil, ora pro nobis! Note: The above is a fresco depicting St. Basil the Great celebrating the divine liturgy.